Photo: Comal Hotel (Eggeling Hotel) and Klein-Kuse House, ca. 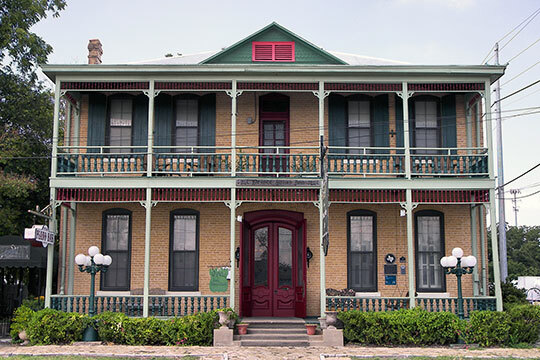 1900/1851, 295 East San Antonio Street, and 165 Market Street, New Braunfels, TX. One of the German immigrants who arrived in New Braunfels in 1845, Joseph Klein built this simple frame house about 1852. Originally it stood at the corner of San Antonio and Market Streets. In 1859 Klein sold the property to William Kuse, a shoemaker who kept his shop in part of the house. The structure was moved here to the back of the lot in 1898, when Kuse's daughter Emilie (1854-1903) and her husband Theodor Eggeling (1851-1916) built the Eggeling Hotel. Recorded Texas Historic Landmark -1979 — Texas State Historic Marker. Listed on the National Register of Historic Places in 1986. Photographed by User:Larry D. Moore (own work), 2012, [cc-by-3.0 (creativecommons.org/licenses/by/3.0)], via Wikimedia Commons, accessed December, 2013. Comal County administrative offices are located at 150 North Seguin Avenue, New Braunfels, TX 78130; phone: 830-221-1100. Comal County was formed in 1846 from Bexar County at which time New Baunfels was designated as the county seat. Early settlers were largely German immigrants with approximately half of the population being German-born in the 1850s.